British-israel.us -- Is Thutmose III The "Hornet" of the Bible? Deuteronomy Chapter 14 Star Chart: Clockwise from when "Thou (Ophiuchus) shalt truly tithe all the increase of thy (solar) seed, that the field bringeth forth (360°) year by (360°) year" (14:22) (1st Tithe); and on the festivals (about 6 months apart, Nisan to Tishri, or 300° between lunar open mouths at 50° per month, with Pentecost on a 3° per day scale to arrive at the sun in Ophiuchus) "thou shalt (lunar open mouth) eat before the (Shekinah) Lord thy God, in the place which he shall choose to place his name there, the tithe of thy (solar) corn, of thy (lunar) wine, and of thine (solar) oil, and the firstlings of thy (Taurus) herds and of thy (Aries) flocks" (14:23) (2nd Tithe) and "At the end of three years (360° x 3 = 1080°) thou shalt bring forth all the tithe of thine increase the same year, and shalt lay it up within thy (solar) gates" (14:28) so that "the (Perseus) stranger, and the (Castor) fatherless, and the (Pollux) widow, which are within thy (lunar) gates, shall come, and shall eat and be satisfied; that the (Shekinah) Lord thy God may bless thee in all the work of thine (Castor) hand which thou doest" (14:29). There was a first tithe that was given to the Levites, out of which Levites paid a tenth part to the priests, Numbers 18:24-28; Nehemiah 10:37, Nehemiah 10:38. Then of that which remained, the owners separated a second tithe, which they ate before the Lord on the festivals, of which the 52 Sabbaths per year were a part, Deuteronomy 14:23, and in the third year (and sixth year in a cycle of seven) a third tithe was given to the Levites and to the poor orphan and widow, Deuteronomy 14:28,29. See also Tobit 1:7. According to Aben Ezra, the third tithe did not excuse the obligation of a second tithe. The seventh year was a Sabbath to the land, and then all things were common, Exodus 23:10, Exodus 23:11. Deuteronomy Chapter 15 Star Chart: Clockwise from when "thy (Pollux) brother, an Hebrew man, or an Hebrew woman, be sold unto thee (Castor), and serve thee six years; then in the seventh year thou shalt let him go free from thee" (15:12) is 2160° (6 x 6 x 60°). Deuteronomy Chapter 16 Star Chart: "Three (red radius) times in a year shall all thy (Ophiuchus & Hercules, Perseus & Cepheus, Gemini) males appear before the (Shekinah Glory) Lord thy God in the place which he shall choose" (16:16). Clockwise from "in the feast of (lunar) unleavened bread" (in Gemini) till "in the feast of weeks" (16:16) (in Ophiuchus) fifty days later (+150°) or 3° per day, till "in the feast of (red radius) tabernacles" (in Perseus) six months later (+150°) or 25° per month, "and they shall not (lunar eyeballs) appear before the (Shekinah) Lord empty" (16:16). "Every man shall give as he is able, according to the (lunar silver or solar gold) blessing of the (Shekinah) Lord thy God which he hath given thee" (16:17). 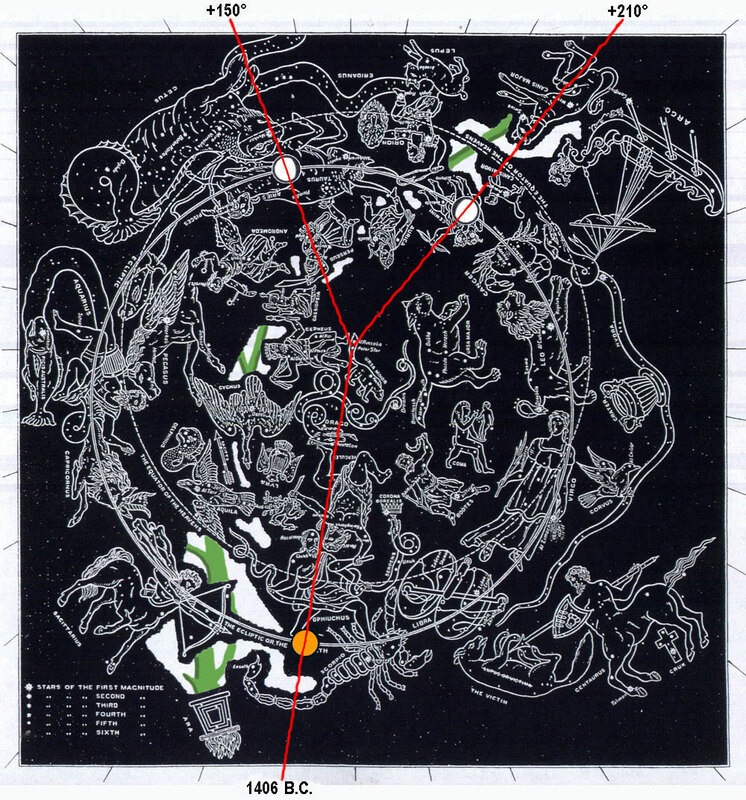 Deuteronomy Chapter 17 Star Chart: Clockwise from when a king (Cepheus) "sitteth upon the throne of his kingdom ... he shall (red radius pen) (Castor) write him a copy ("deuteronomy") of this (solar) law in a (lunar white) book out of that which is before the (Gemini) priests the Levites" (17:18) (360° may represent one month) till "it shall be with him, and he shall (lunar eyeballs) read therein all the days of his life: that he may learn to fear the (Shekinah) Lord his God, to keep all the words of this (two lunar table) law and these statutes, to do them: That his (solar golden) heart be not lifted up above his (Gemini & Perseus) brethren, and that he turn not aside from the commandment, to the right (lunar) hand, or to the left (lunar hand): to the end that he may prolong his days in his kingdom, he, and his (Gemini) children (360°), in the midst of Israel." (17:18-20) is 30 years (a generation -- 360°/12 months per year = 30 years) . From this verse it has been inferred that the crown of Israel was designed to be hereditary, and this is very probable; for long experience has proved to almost all the nations of the world that hereditary succession in the regal government is, on the whole, the safest, and best calculated to secure the public tranquility. Since a generation is usually 30 years, He shall write him a duplicate of this law; translated by the Septuagint, deuteronomy. From this version both the Vulgate Latin and all the modern versions have taken the name of this book. Out of that which is before the priests the Levites - It is likely this means, that the copy which the king was to write out was to be taken from the autograph kept in the tabernacle before the Lord, from which, as a standard, every copy was taken and with which doubtless every copy was compared; and it is probable that the priests and Levites had the revising of every copy that was taken off, in order to prevent errors from creeping into the sacred text. 14:1 Ye are the (Gemini) children of the (Shekinah) Lord your God: ye shall not (Perseus) cut yourselves, nor make any (solar) baldness between your (lunar) eyes for the dead. 2 For thou art an holy (Gemini) people unto the (Shekinah) Lord thy God, and the (Shekinah) Lord hath chosen thee to be a peculiar (Gemini) people unto himself, above all the (Gemini) nations that are upon the earth. 3 Thou shalt not eat any (Scorpio, Drago, etc.) abominable thing. 5 The (Taurus) hart, and the (Aries) roebuck, and the (Aries) fallow deer, and the wild (Taurus) goat, and the (Aries) pygarg, and the wild (Taurus) ox, and the (Aries) chamois. 6 And every beast that (red radius) parteth the (lunar) hoof, and cleaveth the cleft into two (lunar) claws, and cheweth the cud among the beasts, that ye shall eat. 7 Nevertheless these ye shall not eat of them that chew the cud, or of them that (red radius) divide the (lunar) cloven hoof; as the (Taurus) camel, and the hare, and the coney: for they chew the cud, but (red radius) divide not the (lunar) hoof; therefore they are unclean unto you. 8 And the swine, because it (red radius) divideth the (lunar) hoof, yet cheweth not the cud, it is unclean unto you: ye shall not eat of their flesh, nor (Castor) touch their dead carcase. 10 And whatsoever hath not (Cetus) fins and (lunar) scales ye may not eat; it is unclean unto you. 21 Ye shall not eat of anything that dieth of itself: thou shalt give it unto the (Perseus) stranger that is in thy (lunar or solar) gates, that he may eat it; or thou mayest sell it unto an alien: for thou art an holy (Gemini) people unto the (Shekinah) Lord thy God. Thou shalt not seethe a (Taurus) kid in his mother's (lunar) milk. 22 Thou (Ophiuchus) shalt truly tithe all the increase of thy (solar) seed, that the field bringeth forth year by year. 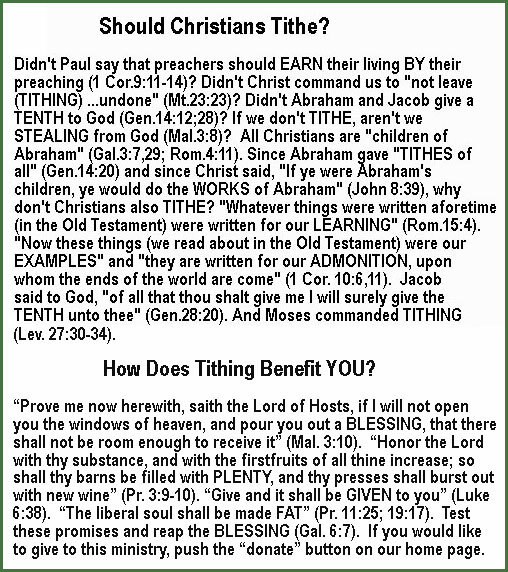 Thou shalt truly tithe - For there was a first tithe that was given to the Levites, out of which they paid a tenth part to the priests, Numbers 18:24-28; Nehemiah 10:37, Nehemiah 10:38. Then of that which remained, the owners separated a second tithe, which they ate before the Lord on the festivals, of which the 52 Sabbaths per year were part, Deuteronomy 14:23, and in the third year (and sixth year in a cycle of seven) a third tithe was given to the Levites and to the poor orphan and widow, Deuteronomy 14:28,29. See also Tobit 1:7. According to Aben Ezra, the third tithe did not excuse the obligation of the second tithe. The seventh year was a Sabbath to the land, and then all things were common, Exodus 23:10, Exodus 23:11. 23 And thou shalt eat before the (Shekinah) Lord thy God, in the place which he shall choose to place his name there, the tithe of thy (solar) corn, of thy (lunar) wine, and of thine (solar) oil, and the firstlings of thy (Taurus) herds and of thy (Aries) flocks; that thou mayest learn to fear the (Shekinah) Lord thy God always. 27 And the Levite that is within thy (solar & lunar) gates; thou shalt not forsake him; for he hath no part nor inheritance with thee. 29 And the (Castor) Levite, (because he hath no part nor inheritance with thee,) and the (Pollux) stranger, and the (Castor) fatherless, and the (Pollux) widow, which are within thy gates, shall come, and shall eat and be satisfied; that the (Shekinah) Lord thy God may bless thee in all the work of thine (Castor) hand which thou doest. 5 Only if thou carefully (lunar ears) hearken unto the (red radius) voice of the (Shekinah) Lord thy God, to (lunar eyes) observe to do all these commandments which I (red radius) command thee this day. 6 For the (Shekinah) Lord thy God blesseth thee, as he promised thee: and thou shalt lend unto many (Gemini) nations, but thou shalt not borrow; and thou shalt reign over many (Gemini) nations, but they shall not reign over thee. 8 But thou shalt open thine (Castor) hand wide unto him, and shalt surely lend him sufficient for his need, in that which he wanteth. 9 Beware that there be not a thought in thy wicked (lunar or solar) heart, saying, The seventh year, the year of release, is at hand; and thine (lunar) eye be evil against thy poor (Pollux) brother, and thou givest him nought; and he (glistening star tear drops rotate) cry unto the (Shekinah) Lord against thee, and it be sin unto thee. And thine eye be evil - An evil eye signifies a covetous disposition. See the same form of expression used by our Lord in the same sense, Matthew 6:23. If thine eye be evil - If thou be a covetous person. Evil eye is by our Lord opposed to single eye, i. e., a person of a liberal, benevolent mind. Covetousness darkens the soul; liberality and benevolence enlighten it. 10 Thou shalt surely give him, and thine (lunar or solar) heart shall not be grieved when thou givest unto him: because that for this thing the (Shekinah) Lord thy God shall bless thee in all thy works, and in all that thou puttest thine hand unto. 11 For the poor shall never cease out of the land: therefore I command thee, saying, Thou shalt open thine (Castor) hand wide unto thy (Pollux) brother, to thy poor, and to thy needy, in thy land. 12 And if thy (Pollux) brother, an Hebrew man, or an Hebrew woman, be sold unto thee (Castor), and serve thee six years; then in the seventh year thou shalt let him go free from thee. 14 Thou shalt furnish him liberally out of thy (Aries) flock, and out of thy (solar) floor, and out of thy (lunar) winepress: of that wherewith the (Shekinah) Lord thy God hath blessed thee thou shalt give unto him. 15 And thou shalt remember that thou wast a (Pollux) bondman in the land of Egypt, and the (Shekinah) Lord thy God redeemed thee: therefore I command thee this thing to day. 17 Then thou shalt take an (red radius) aul, and thrust it through his (Perseus) (lunar) ear unto the (lunar) door, and he shall be thy (Perseus) servant for ever. And also unto thy (Pollux) maidservant thou shalt do likewise. 18 It shall not seem hard unto thee, when thou sendest him away free from thee; for he hath been worth a (Gemini) double hired servant to thee, in serving thee six years: and the (Shekinah) Lord thy God shall bless thee in all that thou doest. 19 All the firstling males that come of thy (Taurus) herd and of thy (Aries) flock thou shalt sanctify unto the (Shekinah) Lord thy God: thou shalt do no work with the firstling of thy (Taurus) bullock, nor shear the firstling of thy (Aries) sheep. 20 Thou shalt (lunar open mouth) eat it before the (Shekinah) Lord thy God year by year in the place which the (Shekinah) Lord shall choose, thou and thy household. 21 And if there be any blemish therein, as if it be (red radius cane) lame, or (lunar eyeball) blind, or have any ill blemish, thou shalt not sacrifice it unto the (Shekinah) Lord thy God. 22 Thou shalt (lunar open mouth) eat it within thy (solar or lunar) gates: the unclean and the clean person shall eat it alike, as the (Taurus) roebuck, and as the (Aries) hart. 23 Only thou shalt not eat the (red radius) blood thereof; thou shalt pour it upon the ground as water. 16:1 Observe (lunar eyes) the month of Abib, and keep the (Aries-Taurus) passover unto the (Shekinah) Lord thy God: for in the month of Abib the (Shekinah) Lord thy God brought thee (Gemini) forth out of Egypt by (black zodiac) night. 2 Thou shalt therefore (Perseus) (red radius) sacrifice the (Aries-Taurus) passover unto the (Shekinah) Lord thy God, of the (Aries) flock and the (Taurus) herd, in the place which the (Shekinah) Lord shall choose to place his name there. 3 Thou shalt eat no (solar golden) leavened bread with it; seven days shalt thou (Ophiuchus and Hercules) eat (lunar) unleavened bread therewith, even the bread of affliction; for thou camest forth out of the land of Egypt in haste: that thou mayest remember the day when thou camest forth out of the land of Egypt all the days of thy life. 4 And there shall be no (solar or lunar) leavened bread (lunar eyeballs) seen with thee in all thy coast seven days; neither shall there any thing of the (Aries-Taurus) flesh, which thou (Perseus) (red radius) sacrificedst the first day at even, remain all night until the (sun on red radius horizon) morning. 6 But at the place which the (Shekinah) Lord thy God shall choose to place his name in, there thou shalt (Perseus) (red radius) sacrifice the (Aries-Taurus) passover at (sun on red radius horizon) even, at the going down of the sun, at the season that thou camest forth out of Egypt. 7 And thou shalt roast and eat it in the place which the (Shekinah) Lord thy God shall choose: and thou shalt turn in the (sun on red radius horizon) morning, and go unto thy (red radius) tents. 8 Six days thou shalt (lunar open mouth) eat (lunar) unleavened bread: and on the seventh day shall be a solemn assembly to the (Shekinah) Lord thy God: thou shalt do no work therein. 9 Seven weeks shalt thou number unto thee: begin to number the seven weeks from such time as thou (Gemini) beginnest to put the (black lunar) sickle to the (lunar) corn (grain). 11 And thou shalt rejoice before the (Shekinah) Lord thy God, thou (Ophiuchus), and thy (Hercules) son, and thy (Castor) daughter, and thy (Pollux) manservant, and thy (Castor) maidservant, and the (Perseus) Levite that is within thy gates, and the (Perseus) stranger, and the (Castor) fatherless, and the (Pollux) widow, that are among you, in the place which the (Shekinah) Lord thy God hath chosen to place his name there. 12 And thou shalt remember that thou wast a bondman in Egypt: and thou shalt (lunar eyeballs) observe and do these statutes. 14 And thou shalt rejoice in thy feast, thou, and thy son, and thy daughter, and thy manservant, and thy maidservant, and the Levite, the stranger, and the fatherless, and the widow, that are within thy (solar or lunar) gates. 15 Seven days shalt thou keep a solemn feast unto the (Shekinah) Lord thy God in the place which the Lord shall choose: because the Lord thy God shall bless thee in all thine increase, and in all the works of thine (lunar) hands, therefore thou shalt surely rejoice. 17 Every man shall give as he is able, according to the blessing of the (Shekinah) Lord thy God which he hath given thee. 18 (Castor) Judges and (Pollux) officers shalt thou make thee in all thy (solar and lunar) gates, which the (Shekinah) Lord thy God giveth thee, throughout thy tribes: and they shall judge the (Gemini) people with just judgment. 19 Thou shalt not wrest judgment; thou shalt not respect (Gemini) persons, neither take a (lunar or solar) gift: for a gift doth blind the (lunar eyeballs) eyes of the wise, and pervert the words of the righteous. 20 That which is altogether just shalt thou follow, that thou mayest live, and inherit the land which the (Shekinah) Lord thy God giveth thee. 21 Thou shalt not plant thee a (greem Milky Way) grove of any trees near unto the (Ara) altar of the (Shekinah) Lord thy God, which thou shalt make thee. 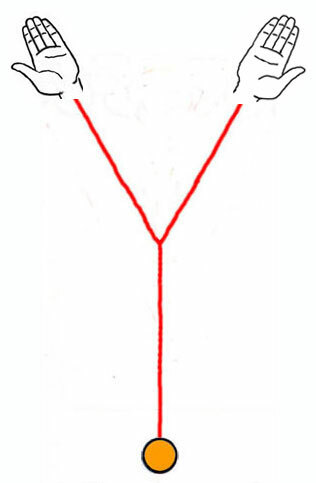 22 Neither shalt thou set thee up any (red radius) image; which the (Shekinah) Lord thy God hateth. 17:1 Thou shalt not sacrifice unto the (Shekinah) Lord thy God any (Taurus) bullock, or (Aries) sheep, wherein is blemish, or any evilfavouredness: for that is an abomination unto the (Shekinah) Lord thy God. 5 Then shalt thou bring forth that man or that woman, which have committed that wicked thing, unto thy (solar or lunar) gates, even that (Castor) man or that (Pollux) woman, and shalt (lunar) stone them with (lunar) stones, till they die. 6 At the (lunar open) mouth of two witnesses, or three witnesses, shall he that is worthy of death be put to death; but at the (lunar open) mouth of one witness he shall not be put to death. 7 The (lunar) hands of the (Ophiuchus & Hercules) witnesses shall be first upon him to put him to death, and afterward the (lunar) hands of all the (Gemini) people. So thou shalt put the evil away from among you. so thou shall put the evil away from among you; both the evil man and the evil committed by him, which by this means would be prevented from spreading, seeing by his death others would be deterred from following his example; as well as the evil of punishment, which otherwise would have come upon the nation, had they connived at so gross an iniquity. then shalt thou arise and get thee up into the place which the Lord thy God shall choose; to Jerusalem, to the great sanhedrim or court of judicature, to which the inferior judges were to apply themselves, in matters of moment and difficulty, for instruction, information, and direction; it being supposed that in such a court such like cases may have been brought before them, and they were expert and understanding in them. 11 According to the sentence of the law which they shall teach thee, and according to the judgment which they shall tell thee, thou shalt do: thou shalt not decline from the sentence which they shall shew thee, to the right (lunar) hand, nor to the left (lunar hand). 12 And the man that will do presumptuously, and will not hearken unto the priest that standeth to minister there before the (Shekinah) Lord thy God, or unto the judge, even that man shall die: and thou shalt put away the evil from Israel. 13 And all the (Gemini) people shall (lunar ears) hear, and fear, and do no more presumptuously. 15 Thou shalt in any wise set him (Cepheus) king over thee, whom the (Shekinah) Lord thy God shall choose: one from among thy (Gemini) brethren shalt thou set (Cepheus) king over thee: thou mayest not set a (Perseus) stranger over thee, which is not thy (Gemini) brother. One from among thy brethren shalt thou set king over thee - It was on the ground of this command that the Jews proposed that insidious question to our Lord, Is it lawful to give tribute to Caesar, Or No? Matthew 22:17; for they were then under the authority of a foreign power. Had Christ said Yes, then they would have condemned him by this law; had he said No, then they would have accused him to Caesar. 16 But he shall not multiply (Aries or Taurus) horses to himself, nor cause the (Gemini) people to return to Egypt, to the end that he should multiply (Aries or Taurus) horses: forasmuch as the (Shekinah) Lord hath said unto you, Ye shall henceforth return no more that way. 17 Neither shall he multiply (Gemini) wives to himself, that his (lunar) heart turn not away: neither shall he greatly multiply to himself (lunar) silver and (solar) gold. Neither shall he multiply wives - For this would necessarily lead to foreign alliances, and be the means of introducing the manners and customs of other nations, and their idolatry also. Solomon sinned against this precept, and brought ruin on himself and on the land by it; see 1 Kings 11:4. He shall write him a copy of this law - mishneh hattorah hazzoth, an iteration or duplicate of this law; translated by the Septuagint, το δευτερονομιον τουτο this deuteronomy. From this version both the Vulgate Latin and all the modern versions have taken the name of this book; and from the original word the Jews call it Mishneh. See the preface to this book. Out of that which is before the priests the Levites - It is likely this means, that the copy which the king was to write out was to be taken from the autograph kept in the tabernacle before the Lord, from which, as a standard, every copy was taken and with which doubtless every copy was compared; and it is probable that the priests and Levites had the revising of every copy that was taken off, in order to prevent errors from creeping into the sacred text. And it shall be with him, etc. - It was the surest way to bring the king to an acquaintance with the Divine law to oblige him to write out a fair copy of it with his own hand, in which he was to read daily. This was essentially necessary, as these laws of God were all permanent, and no Israelitish king could make any new law, the kings of this people being ever considered as only the vice-gerents of Jehovah. 20 That his heart be not lifted up above his (Gemini) brethren, and that he turn not aside from the commandment, to the right (lunar) hand, or to the left (lunar hand): to the end that he may prolong his days in his kingdom, he, and his (Gemini) children, in the midst of Israel. He, and his children, in the midst of Israel - From this verse it has been inferred that the crown of Israel was designed to be hereditary, and this is very probable; for long experience has proved to almost all the nations of the world that hereditary succession in the regal government is, on the whole, the safest, and best calculated to secure the public tranquillity.